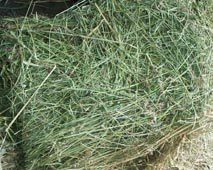 Feeding Horses Hay - How Much Hay Does a Horse Eat? The next question however is; how much of a small square bale is that? What you will have to do is weigh an average bale of hay. It should weigh approximately 60 lbs or 23 kg. The exact weight will depend on how dry the hay is, how long the bales are and how tightly packed they are. Next, count how many flakes are in the bale. There are usually about 12. Now divide the weight of the bale by the number of flakes in it. You'll now be about to calculate the approximate number of flakes you should feed your horse daily. Remember to feed in as many small portions as possible.